We know about the legendary Russian hospitality – гостеприимство (gostepriimstvo). What should you expect if a Russian friend invites you to his house for an impromptu dinner? The Russians like to talk about the “Olivier salad” – салат оливье (salat oliv’ye), created by a French chef in Russia in the 19th century and who jealously guarded the recipe for a very long time. The Soviet version of his dish which became Russian again included various ingredients, but the usual ingredients are potatoes – картошка (kartoshka), ham – ветчина (vetchina), Russian pickles – маринованные огурцы (marinovannyye ogurtsy), and mayonnaise – майонез (mayonez). A jar containing five liters of preserved Russian pickles – малосольные огурцы (malosol’nye ogurtsy ), literally “slightly salted” cucumbers, or tomatoes – помидоры (pomidory) which were stored for the winter will probably be opened for you. It is the ideal accompaniment for a small glass – рюмочка (ryumochka) of friendship. The preparation of these preserves is simple: place cucumbers (or tomatoes) in heated, salted water – соленная вода (solennaya voda) and 4% of aromatic herbs – зелень (zelen’), including the flowering tops of the herb dill – зонтики укропа (zontiki ukropa), or dill seed and dill, horseradish leaves – хрен (khren), bay leaves – лавровый лист (lavrovyy list), and at least five cloves of garlic – пять зубчиков чеснока (pyat’ zubchikov chesnoka). Marinate at least overnight to get a distinct “malossol” flavor, or longer if you prefer a tastier version. You will no doubt have the opportunity to sample a wide variety of salads as easy to prepare as they are delicious – отменные (atmennyye). Most are seasoned with mayonnaise or sour cream – сметана (smetana). An example of a salad that is easy to make on the go has grated carrots – тертая морковка (t’ortaya morkovka), grated cheese – тертый сыр ((t’ertaya syr) and apples – яблоки (yabloki) that have been grated or cut into small pieces – маленькими кусочками (malen’kimi kusochkami) and mixed with mayonnaise or sour cream, of course! Soups – супы (supy) are much appreciated in Russia. The base is often the same, that is, diced onions – лук (luk) and carrots cut into small pieces and sizzled. The rest is according to the wishes of the chef – по желанию (pa zhelaniyu) and his favorite recipes. 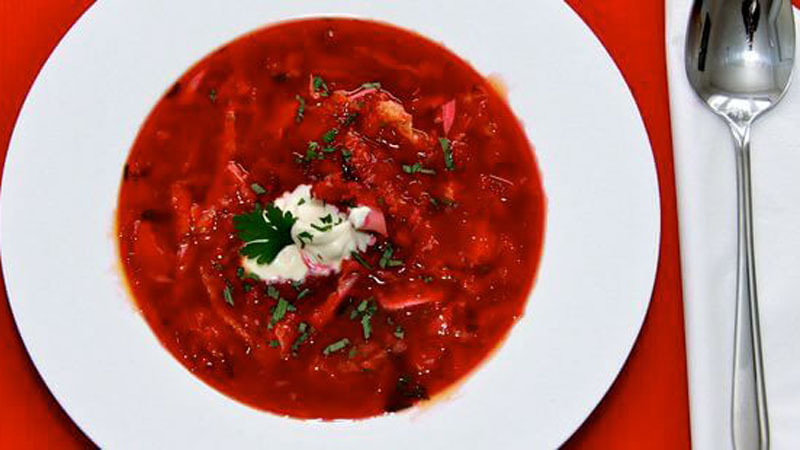 The famous soup borsch – борщ (borshch), a cabbage – капуста (ka usta) and beet – свекла (svekla) based soup traditionally contains meat – мясо (myasa), but it can also often be vegetarian – вегетарианский (vegetarianskiy). It is hardly conceivable to eat soup without bread – хлеб (khleb). A chicken fillet – куринное филе (kurinnoye fil’e) that is covered with mayonnaise and grilled in the oven, for example, is one main dish – второе блюдо (vtaroye blyuda) that can be prepared on the go – на скорую руку (na skoruyu ruku). For a side dish, an alternative to potatoes will certainly be buckwheat – гречка (grechka), a Russian superfood that organic enthusiasts in the West have rediscovered. Everything will often be accompanied by fresh dill or coriander – кинза (kinza), but when Russians have guests, it is not uncommon to put out a dish filled with different herbs in the middle of the table so that everyone can use them as they wish. As for beverages – напиток (napitok), habits are changing. During the times of the ‘Dry Law’ – сухой закон (Sukhoy Zakon) of Gorbachev’s rule, it was customary to empty any container filled with a liquid that had a high alcohol-content, including perfume. Today, though, in addition to the inevitable vodka, beer – пиво (piva) or wine – вино (vino) may be served. Be aware that wine is most often a sweeter type of wine and not a dry wine. If you bring a bottle of wine as a gift for the hosts, it will be greatly appreciated. If you have the habit of drinking water with your meals, you must ask for it because it is not a common practice. It is possible today to find all kinds of cakes in Russia, but “ptich’ye malako” – птичье молоко, literally “bird’s milk”, a sponge cake covered with chocolate, is THE typical dessert – типичный десерт (tipichnyy d’es’ert). In general, it does not matter if you prefer tea – чай ​​(chay) or coffee – кофе (kofe) with your dessert, for both take the same time to prepare. You will see also that, in general, if there is no more coffee or tea, a Russian will not eat any more dessert. Very often, you will be offered a delicious jam – варенье (vare n’ye), home-made, and served in a small dish – блюдочко (blyudochko) which you can stir into your tea, but preferably, you will taste it with a small teaspoon – ложочка (lozhachka) between sips. It is possible to write a whole book about the different kinds of jam and their names! At the end of the meal, good manners require saying “thank you”; even if one is not leaving – уходить (ukhadit’) right away, it signals that one is full – сыт (syt). To show one’s appreciation of the meal, one can say, “My soul is happy” – моя душа давольна (maya dusha davol’na). Some even push their plates -тарелка (tarelka) away out of politeness as if to indicate that they have finished their meal. In any case, you will enjoy the interesting conversation and the pleasure of a lively and cheerful evening!